Marriage is very special, and a significant and wonderful celebration. Marriage in the Catholic Church is a very special event: it is not just about a wedding day, but a lifetime of love, fidelity and commitment. Here we explain the procedures for marriage in the Catholic Church, and the specific details of weddings here at Saint Mary's. FOR LIFE: it is our faith that a valid marriage cannot be ended. We do not believe in divorce. EXCLUSIVE: a couple give themselves to each other and no one else. OPEN TO THE GIFT OF CHILDREN: marriage should not be "closed" in on a couple, but should be the place where the family is born. If you wish to be married in the Roman Catholic Church, there are many things to be done. The first and most basic, however, is to ensure that both members of the relationship agree with all three of these statements (this includes a non-Catholic partner). If you have any doubts about these things, you should reflect on whether it is a Catholic marriage that you are looking for. You can always talk to a priest about this. 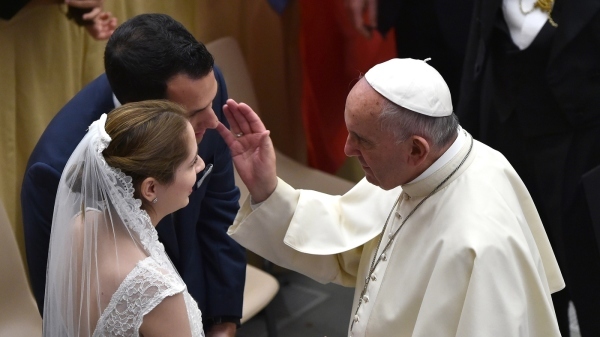 Who can be married in the Catholic Church? neither party has been validly married before (unless the previous marriage was ended by the death of a partner). If you have questions about the validity of a previous marriage, please talk to your priest. If you are happy with all these details, the next step is to arrange an interview with the Parish Priest, by returning an information form (available from the Church) or by using the email form to the right. In the Diocese of Salford we require six month's notice before a wedding - so you would not be able to be married until at least six months after this first appointment. (Please note that exceptions cannot be made to this rule) At the first meeting, the priest will explain all the procedure for marriage in the Church. He will also need to establish that you are free to marry in the Church (it would be useful for you to bring birth and baptism certificates if possible). Please do not make any other bookings until you have confirmed a date for your wedding with the Church. After a date has been booked, you will need to complete a Marriage Preparation Course. Our Parish cluster runs a joint Preparation Course each year: details of this will be sent to you in good time. The course, which is obligatory, looks at the Catholic teaching about marriage, relationships, communications, the wedding ceremony and other topics. You will also meet with the priest who will conduct the ceremony at least two or three times to prepare the details. At some point you will be invited to a Sunday Mass at Saint Mary's to receive the Blessing of an Engaged Couple before Marriage. It would be good to make coming to Sunday Mass together a part of the preparation for marriage at Saint Mary's: getting to know God and the Church better together will deepen and enrich your wedding here! Finally, you might want to have a look at these two videos, which come from the American Catholic publishing house "Busted Halo" - a great source of information about the Church! Just be aware that some things are different in Catholic churches across the Atlantic! Does my non-Catholic partner have to change religion? Not at all: the only request made of a non-Catholic is that they are in agreement with the Church's understanding of marriage, and that they will not interfere with the Catholic party's practice of their faith. This is completely up to you: the Church makes no charge (though we do welcome donations to cover our expenses). We are happy to provide Wedding Booklets, Flowers and other services for you, only passing on necessary costs. You will have to pay Civil Fees to register your forthcoming marriage, but everything else is your choice. How much say do we have in the Service? We follow the rites of the Roman Catholic Church, so much of the ceremony is fixed, but the choice of Bible Readings, Hymns and some other details will be discussed with the couple. What sort of music can we have? Since your wedding in the Catholic Church will be a religious ceremony, only religious music of a Christian character will be allowed in Church - this is not to stop you having your favourite songs played at the Reception! Can we Video/Photograph the ceremony? Yes, though there are some restrictions at Saint Mary's. You should consult with the priest before making any bookings with Videographers or Photographers. You can phone during Office Hours on 0161 724 1765 or, if it's more convenient, use this email form to make your first appointment. Make sure you put your names, an email address and "Marriage" as the subject.